I’ve been meaning to make a paleo tomato sauce for ages but when I spotted these little scotch bonnet beauties at Leicester market, I knew what I had planned for them! 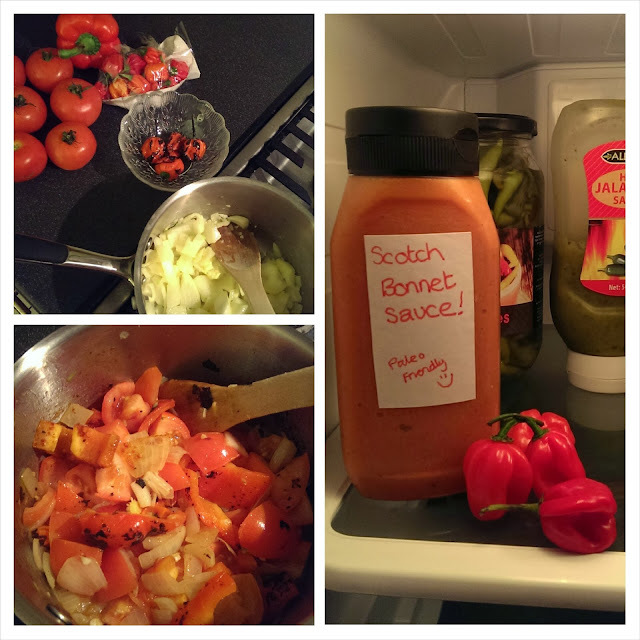 Scotch Bonnet sauce, really tasty with a little kick. So I thought I’d share my recipe. I charred the scotch bonnets and red pepper on my hob to get a little burn on their skins to add some Smokeyness (deseeded both too). I added the scotch bonnets one at a time so I could gage how spicy it was. In the end I found 4 just perfect. This is the tastiest sauce I have ever made and so unbelievably simple. I had enough to fill a sauce bottle and then the rest I poured into ice cube trays to freeze. Previous A Paleo Mexican Fiesta! Next Cauliflower Houmous – Chickpea free!